Freelance AgileTeam Office with Kanban v3.3.0 - CODELISTPRO | Free Premium Scripts, Plugins, Apps Source Code. 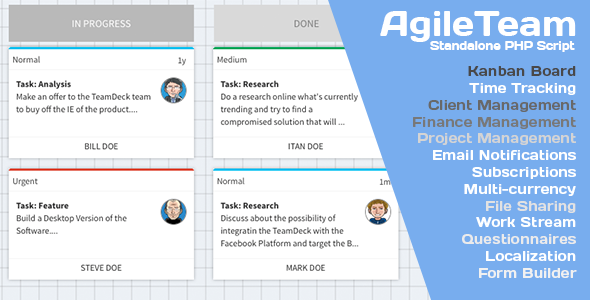 AgileTeam is an Easy to use Web Project Management Software with lot’s of feature that will help run your freelance of small team business starting form the organisation and financial perspective. No matter how big is your team or if you work alone it’s purpose is to quickly and efficiently become your remote freelance office.